In this communiqué, we discuss the use of the Arrhenius relationship to describe the temperature dependence of reacting biological systems, such as those treating wastewater. We also discuss the use of the modified Arrhenius function, and those instances where its applicability is limited. We show that the error when using the modified relationship is 7% at 30ºC, 15% at 40ºC and 25% at 50ºC. We conclude that whilst the modified relationship is acceptable at lower temperatures, in those applications where higher temperatures are reached (above 25ºC) the error with using the relationship may not be acceptable. We present an Arrhenius equation for use in biological systems, which is applicable for all temperature ranges. The kinetics of the degradation processes occurring within many reacting biological systems, including municipal wastewater treatment (Benefield and Randall, 1980; Crites and Tchobanoglous, 1998; Nitisoravut and Klomjek, 2005), anaerobic lagoons (Oleszkiewicz and Koziarski, 1986), facultative lagoons (Mashauri and Kayombo, 2002) and constructed wetlands (Nitisoravut and Klomjek. 2005; Mashauri and Kayombo, 2002; Andreottola et al., 2007; Kadlec, 2009; Marsili-Libelli and Checchi, 2005; Rodgers and Dunn, 1995; Rousseau et al., 2004) are described using a modified form of this equation (denoted the Modified Arrhenius Function or MAF) given in Eq. (3), with temperature, T, given in degrees Celcius (Benefield and Randall, 1980; Haug, 1993; Kadlec and Knight, 1996; Kadlec et al., 2000). The MAF is attractive as an experimental equation because of its ease of use; the temperature is given in degrees Celcius and the temperature correction factor, θ, is measurable. 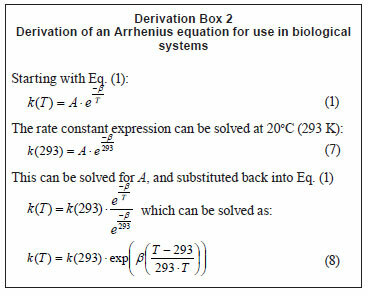 The derivation of this form of the Arrhenius Equation is based on the assumption that the operating temperature is close to or below 20ºC (Derivation Box 1). In countries with hot climates such as South Africa, and especially those with high humidity, where the effect of evaporative cooling is reduced, the MAF may not be applicable and could result in water treatment and other biological systems that do not perform to design specifications. 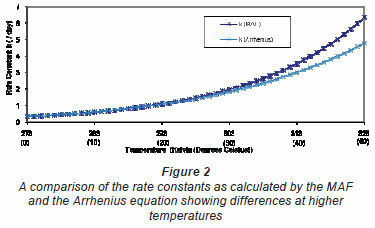 For the temperature ranges where this assumption may not hold true, a new form of the Arrhenius Equation is proposed here that will not differ significantly from the current form of the MAF at lower temperatures, yet will follow the exponential form of the Arrhenius equation at higher temperatures. The primary assumption to be considered when using the MAF is that the temperature is not much greater than 20ºC. This assumption allows the conversion of an exponential function into a power function, which has different mathematical properties, which are more pronounced with increasing temperature. The value for k was calculated for the temperature range over which the data were most likely collected; i.e., 0ºC to 20ºC (273K to 293 K) using the MAF, and a plot of ln(k) vs. 1/T is shown in Fig. 1. The points are essentially reproduced data, and these 'data'; have been regressed (the line through the points) to determine the constants in Eq. (7). The y-intercept and the x-intercept of this plot correspond to α and β in Eq. (7). The twisting of the data around the regressed line is caused by the conversion of data found from a power function being presented as an exponential function. These calculated values for α and β were then used to fit the Arrhenius function given by Eq. (1), such that A = 8.83·106 and = 4600. 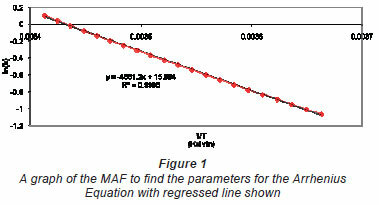 Using these 'data';, a comparison of the Arrhenius equation and the MAF was performed and the results are presented in Fig. 2. This analysis indicates that the difference between the 2 forms of rate constant is 7% at 30ºC, 15% at 40ºC and 25% at 50ºC. This difference would become greater at higher temperatures since the exponential law reaches an asymptote at the value for A at infinite temperature, whilst the MAF increases infinitely with increasing temperature. The analysis was halted at 50ºC since there are few reacting biological process that will operate temperatures higher than this (although some bio-metallurgical operations may occur at temperatures higher than 60ºC). In hot climes and for certain industries (such as distillery effluents) it is possible that the effluent temperature may rise above 30ºC and thus the assumptions upon which the MAF is based may not be valid. 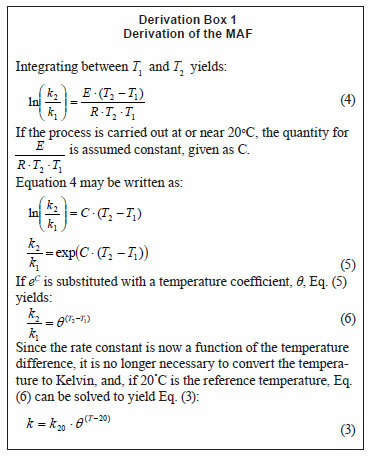 It is with this in mind that a new functional dependence of k on temperature, given by Eq. (8), is proposed (Derivation Box 2). In this derivation, the values of k20 as measured for the MAF will still be valid (shown as k(293)). It is, however, a simple modification to change the temperature to ºC. Whilst the MAF is used substantially for the wastewater and other industries (Benefield and Randall, 1980; Haug, 1993; Kadlec et al., 2000), and is undoubtedly applicable to cooler and temperate climates, it should be used with caution at higher ambient or reaction temperatures since it may lead to the use of a rate constant which is greater than that which is occurring. At temperatures lower than 20ºC it is not important which equation is used, because the rate constants are small and the difference between the 2 functions is negligible. In countries with hot climates, and especially those with high humidity, where the effect of evaporative cooling is reduced, the MAF may not be applicable and could result in systems that do not perform to design specifications. The MAF may also overestimate the rate constant required for designing systems to treat warm effluents, such as distilleries or for use in hot biological reacting systems such as composting or heap leaching. It should also be relatively easy to reassess existing literature to calculate the values for A and β and these could be used, with the published values for k20 to find the rate constant at any temperature. Received 28 February 2011; accepted in revised form 14 December 2011.